BioFlush is a drain un-blocker that uses non-chemical and environmentally friendly bacteria and enzymes to break down organic waste. 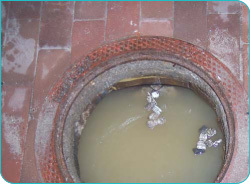 From time to time, we have all suffered from the frustrating occurrence of having a drain blocked, which is usually caused by a build-up of organic debris, such as plant-based material, protein, starch based waste and the usual suspects, fats, oils and greases, all of which can prove troublesome in the drain environment. Inevitably, unless treated, the build-up increases, with the usual affect of creating malodours and of course, the unpleasant sight of an overflowing drain. Once the problem has been identified, the next course of action has historically been to apply toxic chemicals, in the form of strong acting bleach, a known chemical brand or caustic soda, which is not only harmful to the environment, but is also often added in great abundance, causing even greater problems to the drain network. BioSmart’s bacterial technology and ultimate solution completely centres around the application of “Enzymes”, which, simply put, are ‘biological digesters’. Enzymes work by breaking apart large complex compounds, known as ‘substrates’ into smaller, more easily absorbed nutrients that bacteria can absorb. Each Enzyme is designed to unlock and breakdown a specific food source and therefore, a specific bacteria is required to produce the required enzyme and this is true of “BioFlush”. BioFlush is a carefully selected blend of enzymes designed specially for breaking down organic debris such as plant based material, protein and starch-based waste, fats, oils and greases. Not only do the enzymes use a ‘competitive exclusion’ process to starve the bad bacteria from its food source but ensures a trouble-free drain and regular dosing will help to avoid debris build up and maintain clear, freeflowing drains. The product is a drain unblocker, which is an effective enzymatic treatment for breaking down organic waste and subsequently, unblocking the drains. The product is readily biodegradable, non-flammable and entirely non-toxic but most importantly, the selected enzymes are friendly to the environment and are entirely ‘green’. BioFlush is supplied in ready to use format and should be dosed in drains last thing at night. For best results pour a few litres of warm water into the drain prior to adding a 500ml neat shot of product. Ideally, no further water should be poured down the drain following application. After the overnight dosing, a further few litres of warm water should be poured down the drain to flush clear any loosened organic matter. To help maintain a trouble free drain, BioSmart's BioDrain product should be used on a regular basis. The product contains enzymes and you should avoid breathing the product spray. The material should be handled under good housekeeping practices. You should wash hands after use and keep away from drinking water sources. The product is non-flammable, non-toxic and biodegradable and when used is completely safe. For best results, store product in a cool, dry place.